Fusion Tech dumpers are custom designed to meet the needs of your specific application and deliver on your production goals. We offer a variety of options and capacities that provide efficient and effective product movement in your processing operation. Our dumpers offer efficiency and versatility, dumping products from vats, boxes, barrels, and drums. 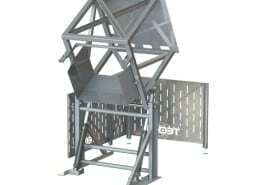 We can customize any dumper to fit the product container needing to be dumped. We offer customization of loading heights, discharge heights, capacity, and cycle times to fit your needs. You can see our standard dumpers above that are available for purchase. All dumpers can be modified to fit the needs of your specific application, or purchased with the options and features shown. 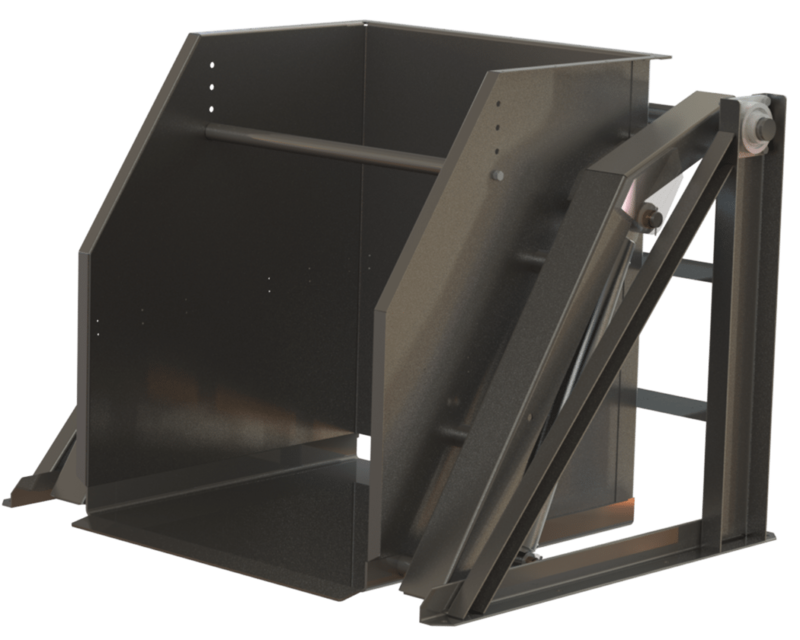 Fusion Tech dumpers can be custom designed to meet the needs of your specific application. Our dumpers feature a heavy duty frame and carriage, capable of handling up to 3,000 lbs in the dump cycle. Our dumpers are designed to be durable enough to withstand the most demanding use. 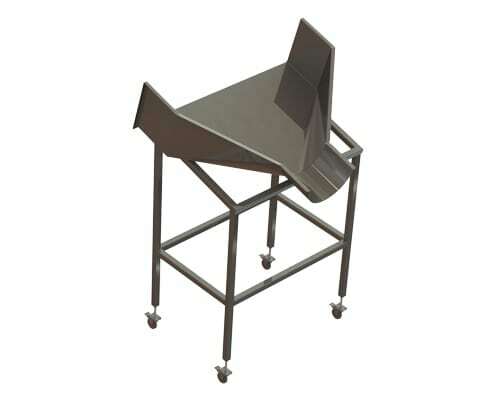 Our dumpers meet all AMI Sanitary Equipment Design requirements, making them easy to clean and safe to use in food processing facilities. Fusion Tech Dumpers come equipped with a number of standard features designed to for durability, sanitation, and safety. 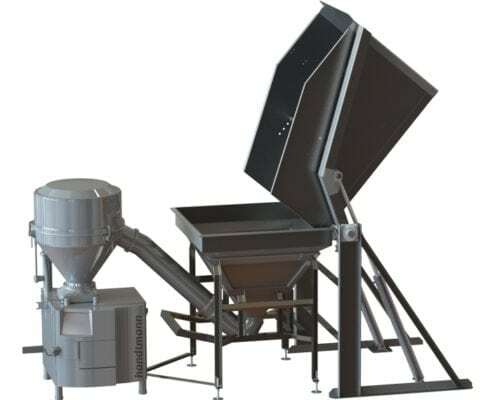 Secures vat in the dumper carriage to eliminate movement during the dumping cycle. Fusion Tech Dumpers can be equipped with a number of optional features to meet the needs of your specific application. 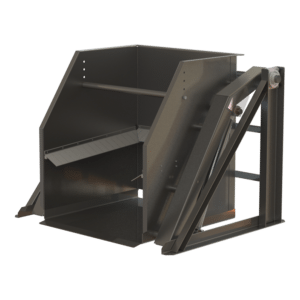 Fusion Tech Dumpers can be equipped with a number of optional features to keep your employees safe during the dump cycle. See Options section below for pictures and explanations of safety features. 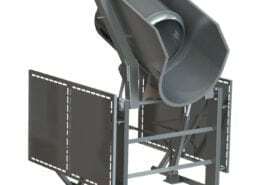 Download the Fusion Move catalog to learn more about our sanitary and robust dumpers. Upgrade your dumper with accessories, or add it to a pre-made system for ease of moving product. 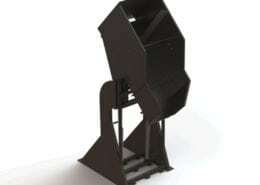 Our dumpers can be custom designed to meet the footprint, discharge height, overall height, and discharge angle you need. Available on all Fusion Tech dumpers. Options shown on our pivot dumpers. 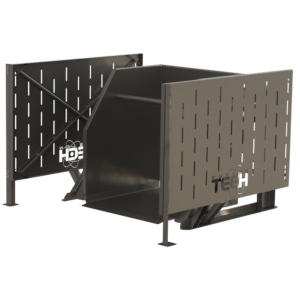 Prevents debris from pallet or skid from entering product during the dump cycle. The safety bar drops down before the dump cycle begins to keep employees out of the operating zone. 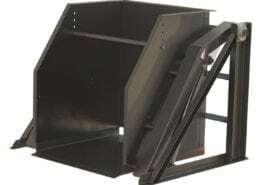 Side guards keep employees away from the sides of the dumper during the dump cycle. Guards swing out for easy access during maintenance and cleaning. 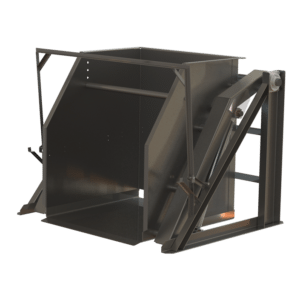 The safety gate utilizes the side guards and adds two gates in front of the dumper to keep employees at a safe distance during the dump cycle. Guards swing out for easy access during maintenance and cleaning. 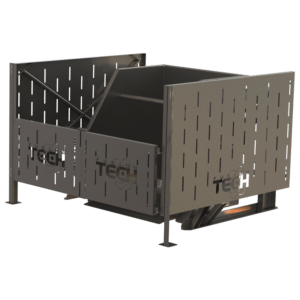 Fusion Tech Dumpers come with a number of design and sanitation features that add value to your facility and processing operation. Click on each number to learn more about our Dumpers. 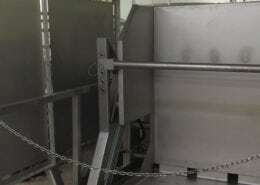 Locks vat into place to prevent movement during the dumping cycle. Heavy duty epoxy coated cylinders provide years of dumping use. 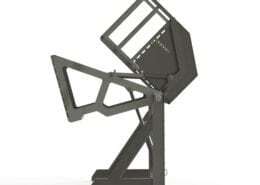 Every aspect of our pivot dumpers is designed to withstand the most demanding environments. Back wall is open along the carriage floor for easy cleaning and sanitation.